The plot: Evan Baxter retires as Buffalo newscaster to become the Congressman for his state with the slogan “Change the World!”. Then magic begins to happen: The Almighty appears to Evan and gently commands him to build an Ark before a disastrous flood comes in, like Noah did in the Bible. The lumber and tools soon arrive at Evan’s Virgina new suburban house. Next day animals begin to arrive in pairs on his loan. The good: I liked a little joke about the other Steve Carell’s movie (”The 40 Year Old Virgin Mary” movie being showed in the theater Evan drives by). Another cool plug was Jon Stewart’s Daily Show talking about Congressman Baxter building the Ark. 3rd reference was when the Ark stopped – just like in Speed-2. I liked John Goodman as menacing Congressman Long. Nice musical score by John Debney. The bad: Wanda Sykes and Evan’s secretary was annoying. The way God appears to Evan was not in any way original from the old movie. “Ark Building for Dummies” was a dead giveaway. Worst of all, not funny. The animals were following Evan around like Dr. Dolittle. 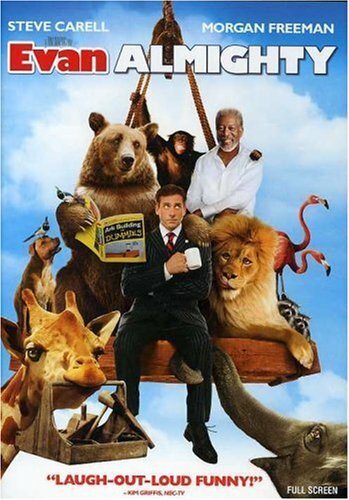 Steve Carell is usually funny, both on John Stewart’s show and in the movies as well, but it seemed like he struggled with the material of this movie. No wonder the movie flopped at the box office and won “The Worst Sequel” award. The summary: It’s definitely a movie with a heart in the right place, and it delivers on the story, and it’s also a movie for the whole family and kids, but not funny at all. Consider buying flood insurance. p.s. I had it on HD-DVD with DVD on the other side, and HD-DVD side wouldn’t play. Maybe it’s because the disk was unusually thin – I haven’t seen DVDs that thin before.